As I prepared for a visit from a local garden club tomorrow, I was pruning and weeding, of course. When I noticed a lone parsnip had grown up in the raised bed where I grew them a couple of years ago, I nearly pulled it out. 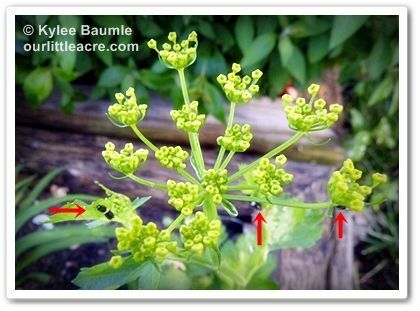 You can see three of the black swallowtail caterpillars in this picture. Fortunately, I noticed something else. It had FIVE Eastern Black Swallowtail caterpillars on it! 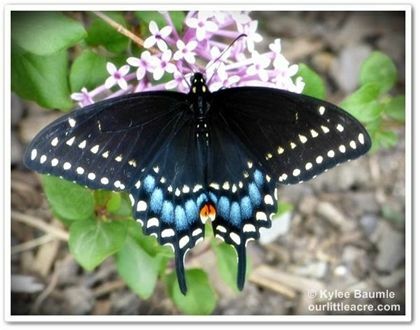 The black swallowtail was one of the very first butterflies I noticed in our garden, back on May 18th. I snapped a photo of a female as she sipped nectar from a lilac. I don't know if the butterfly in the photo is the one that laid the eggs from which these caterpillars hatched, but someone did! My concern is whether or not this lone parsnip will be able to sustain five caterpillars until they form a chrysalis. We have parsley ad dill in our garden too, so if it looks like there's nothing left and the caterpillars are still fairly small, I'll move them over to the other plants. Another baby spent some time in our flower beds this evening. I'd mentioned a day or so ago on Facebook that I'd heard a sound like a squeaky door opening and closing and had looked up in the tree to see that it was a baby blue jay just trying out its voice. I heard it again this evening and this time it was sitting on the top rail of our fence at the back of Max's Garden. Now really, it's adorable, don't you think? 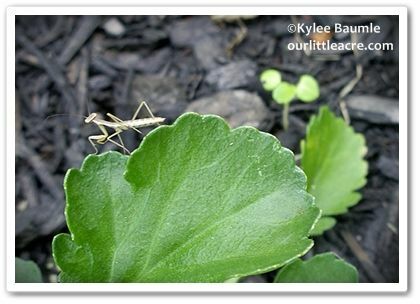 Over the weekend, I saw a few very tiny praying mantids. These were so tiny that undoubtedly, they'd just emerged. Babies are only about ¼ to ½ an inch in length! 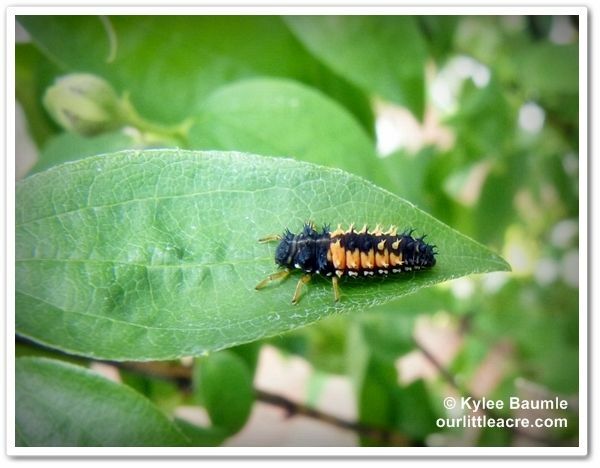 And about a week ago, my new mock orange shrub was covered with baby ladybugs! Doesn't look much like a ladybug yet, does it? I love seeing new life like this in our gardens! So many cute babies in your garden...I love it!!! That baby Jay is just the cutest little guy! We have so many Jays in our garden, but I've never seen a baby...thanks for these great pictures!!! I think I need to take a closer look at things in my garden...I might have babies too! I keep patch of parsley just for my butterflies. 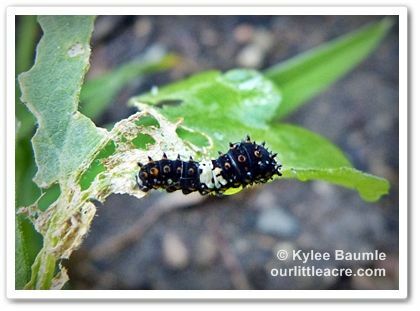 I love finding the caterpillars on them & always worry whether not there is enough for them to eat. I sure wish I was touring your garden! Glad to see so many babies in your garden. Love seeing those ladybugs and butterflies. 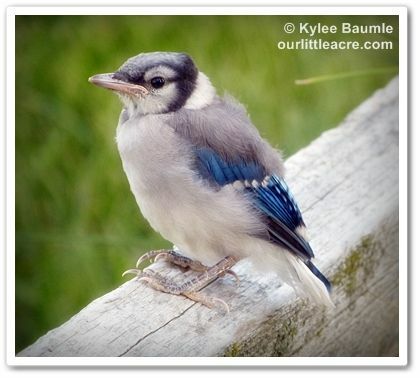 Baby Blue Jay is just adorable! What a nice view you had! The black swallowtails have swarmed my catawaba rhododendrons in the last week. They sure do have a diverse appetite.